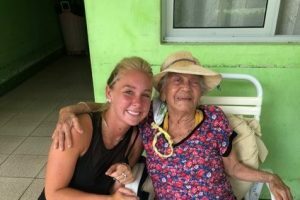 Culture and Communication in Costa Rica Language and culture courses at W&L prepared Marissa Miller '21 for a fun, educational trip to Nicoya. 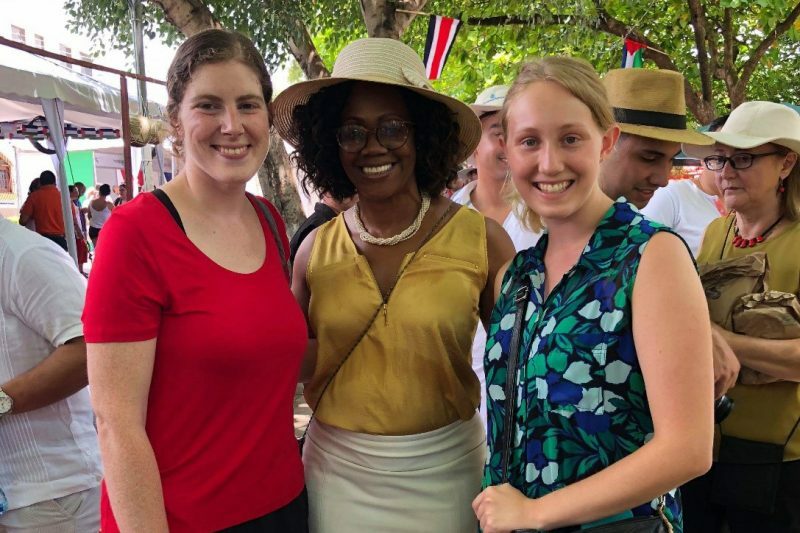 Marissa Miller ’21 (right) and a friend with Costa Rica’s First Vice President, Epsy Campbell Barr (center). I found out about the program through the Latin American and Caribbean Studies Program. I had already taken LACS 101, so I was able to earn 3 EXP credits for LACS 453 – LACS Fieldwork. I spent six weeks in Nicoya, Costa Rica, living with a host family. The first four weeks I attended the Spanish Academy and worked in the afternoons, then shifted to working full time during the last two weeks. For the first couple of weeks I worked as an English teaching assistant in the primary school nearby, and then as an assistant in the assisted living home, Hogar de Ancianos de San Martin, during the remainder of my time. While at the home, we played games aimed at improving memory, chatted about what they used to do or where they lived, and even danced with them if there was music on! My host family was comprised of my mom, twin sisters in their senior year of high school (Mar and Sol), and two older siblings who often visited the house with their families. Spanish lessons took place in the morning at the academy, with the afternoon saved for our work study and occasional extra lessons or activities, such as a mountain trail hike or a video about the nature or history of the town. While at the primary school, I helped two younger students memorize an essay written in English for an upcoming contest. At the assisted living home, while playing card games, I often talked with a group of elderly guests about how their day had been. They always enjoyed engaging in conversation and talking about anything—unless of course their team was playing in the World Cup! Did you meet anyone during the experience who made an impact on you? One of the girls I met, a friend of my host sisters’, has been someone who I think about often. I was in Costa Rica when some of the worst news broke about the protests and deaths of students in Nicaragua. As I came to know her, I found out that she had actually come to Costa Rica four or five years earlier with her family. They had been hoping to travel back to Nicaragua soon, but became worried with the news of violence spreading. As high school was ending, she would have to reapply as an adult for an extension of stay in Costa Rica, for either work or for college. Being a high school student while facing this amount of stress, between performing well on exams, searching for colleges and waiting to hear about her status in Costa Rica, can pile up quickly. While I do not know where she is now, I hope I can keep in touch with her and other friends I made while there. Truthfully, the most challenging part was communication! While working with the students, they initially struggled to understand the meaning of what they had written. So to improve their memory I helped them understand word-for-word translations or provided examples of words that were unfamiliar. With the elderly, it took a few tries to understand each other sometimes, between the difference in hearing levels or retention and difference in word choice. Yet, we encouraged each other to continue talking, finding different ways of explaining an idea. What else were you able to participate in? I was given permission to visit the high school with my host sisters during a festival. The senior class is responsible for putting together a festival to share the cultural, historical and social importance of various regions of Costa Rica. I was excited to help them out with their booth and to learn more about other regions as well as meeting more classmates. They had a small showcase in which they demonstrated some traditional dishes of each region, traditional styles of dress, horsemanship and indigenous art. It was all incredibly beautiful to see! Also, I was in Nicoya during the national holiday, Guanacaste Day. Guanacaste is the region in which Nicoya resides. On July 25th, 1824, the Guanacaste region voted to leave Nicaragua and be annexed by Costa Rica. Since the official paperwork and laws were passed in Nicoya, the president and vice president typically come each year to the town square. While with my class from the Academy, I had the opportunity to meet Epsy Campbell Barr (pictured above), the vice president of Costa Rica! Meeting her was very exciting and also made me realize how tightly knit communal and cultural bonds can be in a small nation. Nicoya is surrounded by mountains and pastures. It’s an amazing place to explore, and is known for providing farm-fresh produce each day. The town is small, and a distance away from main tourist hot spots. I loved that I was able to meet and converse with people as someone genuinely interested in them and the town, rather than as a tourist. I would say that courses in Spanish and Latin American history definitely helped me be prepared for Costa Rica without feeling overwhelmed, especially by providing knowledge and awareness of cultural differences and celebrations. I felt confident going into and leaving the program insofar as the ability to stay on top of the lessons while also being able to delve into new in-depth ideas and topics. I would love to return to Costa Rica to visit my host family once more. I also plan to study abroad at least once in the coming year in Latin America, and I intend to learn more about the past through historical and cultural perspectives.